Freezing your Eggs, What you need to know about it? What do you need to know about freezing your eggs?	" What is freezing of eggs? Egg freezing also known as Oocyte Cryopreservation is a process of preserving a woman’s eggs (oocytes) to be used in future. In this process, a woman’s oocytes are extracted, frozen and stored to protect the reproductive potential in the women. This is a very successful method which is widely used. Did you know? – The first human birth from the frozen egg was reported in 1896.
wants late childbearing to pursue education, career, etc. When should you think about freezing your eggs? According to doctors the best age to preserve your egg is in the late 20s. Or 30s. You can still preserve your eggs if you are in your late 40s, but the rate of success after 40yrs of age decreases by 10%. Factor affecting the success of egg freezing? Firstly, the doctor will do a fertility assessment (overall health) and may collect your medical history. Then he will prescribe hormonal injections (for 8-11 days) for ovarian stimulation. During these days you’ll be required to visit the clinic for monitoring. Blood tests and transvaginal ultrasound will be performed to assess your response to the medication. Once the eggs are matured and ready to be retrieved, an egg retrieval surgery will be done. During the surgery, you’ll be under sedation and won’t feel anything. The doctor will collect several eggs with the help of a needle inserted through your vaginal walls, i.e., no cuts or stitches are required for the process. These eggs are then frozen by the use of a slow-freeze method or a flash-freezing method known as vitrification. For how long egg can remain frozen? The eggs are frozen in – 196 degrees Celsius, which preserves the egg for more than the ten years. But it has been observed that the quality decreases after ten years. How many eggs should be stored to have a successful pregnancy? If ten eggs are stored, only seven are expected to survive till the end. Only 5-6 becomes fertilized and develop into the embryo. Usually, three to four are transferred to woman up to the age of 38. So typically, ten eggs are recommended to store for each pregnancy attempt. This method has no major health effects on a woman. But bloating can happen, as you have to take some fertility medicine during the procedure and these medications cause some changes in body weight. But this is not permanent; you can quickly lose this weight with the help of regular exercise. 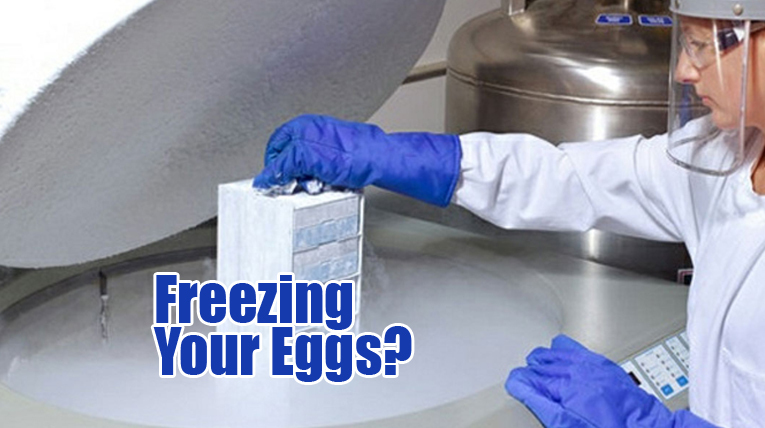 Is egg freezing process painful? Hormonal injection and egg retrieval may sound a painful procedure, but they are not as bad as you think. Most of the injections that are given during the process are low volume, and very tiny needles are used and do not cause that much of pain. How will the eggs be used in future? When the female is ready to use her frozen eggs, the eggs are placed in warming solution and are assessed. How successful is freezing the egg? According to medical data, approximately five thousand children have born with the help of frozen egg. Studies have shown that over nine hundred babies born from frozen eggs, showed no increased rate of congenital disabilities when compared to the average population. There were no chromosomal defects in embryos developed from frozen eggs. Over more than 3,00,000 children are born worldwide from frozen eggs using cryopreservation techniques. So, one can easily say this method is very safe.